Groundwork USA’s Neighborhood Voices Curriculum brings together interactive lessons, resources, and guidance for facilitating a youth-driven community engagement project. Designed for those involved in youth development—from program coordinators and the managers who supervise them to youth program fundraisers and youth program participants themselves—this curriculum will help you design, gather resources for, and implement an inclusive, youth-driven community engagement project. 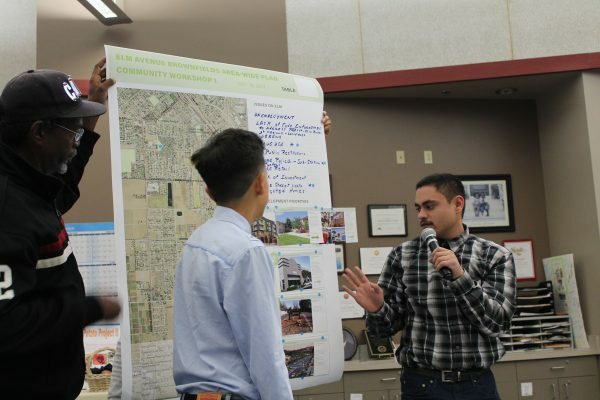 Through the Neighborhood Voices Curriculum, program leaders and teens alike will gain confidence and mastery using concepts related to brownfields, urban planning, environmental justice, and community development. Fresno youth present their findings from a PhotoVoice exercise. Groundwork USA’s Brownfields Technical Assistance team created this curriculum to help community builders use municipal planning processes as “teachable moments.” We do this by involving young people as leaders of community outreach and engagement activities to inform decision-making, budgeting, and prioritization. Pilot tests of this curriculum have been successful in improving the typical planning processes of municipal governments. Through creative strategies that “meet people where they are,” young people have used this curriculum to transform how everyday citizens share ideas and expertise and to impact the ways community leaders prioritize cleanup and reuse of vacant, contaminated, or otherwise underutilized land. The tools and resources in this guide can be adapted for your community, infusing “real life” advocacy, outreach, and public speaking activities into your youth development program. We invite you to use this curriculum in whatever ways you find most beneficial, whether focusing on individual sections and activities or following the guide week by week. Availability of time, resources, and staff capacity; existing partnerships and/or need to build new ones; the length of your program; and the current phase of your planning process may influence how you use this curriculum and which parts are best suited for your project. Identify a focus area or planning process where input representative of all community members has yet to be gathered or heard. Reach out to planners and decision-makers in charge of the planning process you wish to augment to collaboratively discuss the ways your community engagement work could add value. Together, identify common goals and priorities for both municipal leaders and residents, then structure your engagement project to gather more detailed information about those goals and priorities from residents. Should you need support utilizing, adapting, or advocating for the use of this curriculum in your community, please visit the Groundwork USA website to submit a request for our team’s free technical assistance. Section 7 – Developing Key Questions: What Do We Want to Know Specifically? Every project needs a solid foundation. Prior to working through this section, identify a focus area or planning process where robust community input has not been heard and/or would be impactful. Have your participants get to know one another and discover the individual strengths each person brings to the team by engaging in Groundwork USA’s “Getting to Know Your Strengths” activity. Create a project overview that communicates your community engagement effort’s goals and why they’re important. Include facts about your own organization and your project’s partners, timeline, and goals. Review this sample project overview to get started. Use this project overview to build understanding among planners and decision-makers in charge of the planning process your team aims to augment with neighborhood voices. This is an opportunity to express your intention to gather data, analyze it, and present it as a culminating activity to the steering committee or other decision-making body involved in the planning process. Set the stage by reviewing learning goals and ground rules with your team members. Consider facilitating a conversation around any other ground rules or goals that members of the group may want to add. Get up to speed about brownfield sites, contamination, and the ins and outs of site testing, cleanup, and reuse, and environmental justice with Groundwork USA’s information-filled Brownfields 101 slide deck. Read The Making of Dr. Nina Scarito Park in Lawrence, Massachusetts, and dream big about what’s possible on former brownfield sites. Utilize Groundwork USA’s sample “Brownfields Jeopardy!” interactive game to help members of your group become more comfortable with what can sometimes seem overly technical or jargon-filled language. Orient your youth team to patterns of environmental racism and the disproportionate burden that low-income communities and communities of color face from brownfields and other current and historic toxic land uses with Groundwork USA’s interactive Environmental Justice Literacy Curriculum and accompanying Environmental Justice Timeline Activity. This section offers a prompt to identify a number of brownfield sites in your community or focus area and visit those sites to familiarize participants with their presence in the community landscape. Conduct a walking tour of your project focus area that includes a visit to one or more brownfield sites. Meet on-site with one or more local stakeholders (e.g., city councilor, community organizer, municipal planning staff member, etc.) involved in the planning or the brownfield testing/cleanup/reuse work happening currently or previously on the tour site(s). Visit completed brownfield transformation projects in the neighborhood or in nearby communities to gain perspective on what’s involved in these kinds of transformational projects and the kinds of new land uses that are possible on former brownfield sites. At the public library or local planning department, explore your community’s Sanborn maps to learn about the evolution of historical land uses in your focus area. (Check out what Sanborn maps look like here.) A planning department staffer or local planning board member might help orient your team members with Sanborn maps from your area. This section is designed to help both team members and community members establish a baseline understanding of the real estate development process, from vision, design, and financing through permitting, construction, and ribbon cutting. Learn how a piece of property can be developed into housing, a community center, a retail store, an institution, or something else by checking out Groundwork USA’s Real Estate Development Process Map Explore the ins and outs of how real estate development happens, the steps involved in getting a project from vision to plan to reality, and what points in the process can be most effective for influencing property use and outcomes, including advocacy for specific benefits to community members, such as local hiring agreements, access to a new public amenity, and more. Now that you are equipped with knowledge about brownfields and the planning and development process in your community, how do you make sure you understand the goals and concerns of the people who live there? This section focuses on inclusivity, why it is important, and how it relates to community development and planning. Resources and tools in this section can help you move a conversation toward ways to engage community members whose voices are frequently missing from public planning and decision-making processes. Discover the identities, experiences, and needs of citizens in your community by exploring US Census data and the demographic trends that data can show. Visit www.census.gov. The American Community Survey (ACS) is a particularly helpful dataset because it captures and conveys data at the community and county levels. The annual ACS is the largest household survey that the Census Bureau administers. Explore American Fact Finder to access ACS datasets. Connect with your community’s planning department. What data do they have that might be helpful to you? Where else might they recommend you look for relevant data about your community? Work to identify who is missing from the planning process. Consider who is already involved in the local brownfield cleanup or other community projects you have identified. How do the cultural, ethnic, gender, and racial identities of those already involved compare to the demographic data you uncovered using Census.gov or other resources? What segments of your community’s population are missing from the process? How might you go about engaging these “missing voices”? Check out Groundwork USA’s “Best Practices for Meaningful Community Engagement” tool for inspiration, tips, and guidance. Brainstorm as a group to identify potential locations in your community where your team members might meet “missing voices,” collaborators, and stakeholders where they are. Timing: Be deliberate about your timing! Most people travel in their community during after-work and after-school hours (i.e., 3:30pm-6:30pm), so consider places where you might best encounter people for a quick engagement moment during that transition time. Be visible: Set up a small folding table to display and share materials and catch people’s eye. This section prompts the project coordinator to engage team members in an exploration of community assets. This process highlights your community’s existing strengths and reveals where there are gaps in the availability of or access to resources. As you identify the people and things that contribute to your community’s wellbeing, consider how these assets can be harnessed or combined in new ways to address unmet community needs. Define, explore, and experience the concept of asset mapping first-hand. Check out Groundwork USA’s “What is an Asset?” tool. For further reading to prepare for this discussion, check out Community Toolbox: Identifying Community Assets and Resources. Use Groundwork USA’s Asset Mapping lesson to facilitate a brainstorming session with your team to identify your community’s various assets. This is a “behind the scenes” section, requiring project coordinators to spend ample planning time to ensure successful community outreach and engagement activities. All of the knowledge acquired by your group so far will inform how you move forward in this section. It is at this point that you tailor the project to your specific community by identifying high-traffic locations to set up engagement station(s) and building partnerships with local organizations. Do not delay starting the work described in this section; it can take weeks to prepare for and finalize communications and logistics! Who do you intend to engage? At what high-traffic locations and times will you encounter these desired stakeholders? Ideally, you will identify three to five different locations and varying times and days of the week. Are there upcoming partner events or activities you might leverage to encounter desired stakeholders? Consider policies that may impact how you collect data, and prepare accordingly. In particular, if using federal funds (from the Environmental Protection Agency or other federal departments/agencies) to support your team’s community outreach and engagement activities, review the Paperwork Reduction Act (PRA, 44 USC §3501 et seq. (1980) and abide by these rules when designing the details of your outreach methodology. EPA’s summary of the Act states that “the Act generally provides that every federal agency must obtain approval from the Office of Management and Budget (OMB) before using identical questions to collect information from 10 or more persons.” Note: obtaining OMB approval is not easy to do, nor is it a fast process. One way to avoid the PRA restrictions altogether is to find and use non-federal funds for the design, distribution, or collection of your survey. If you can, find other resources and partners who can pay for these costs as they relate to your project. Take a look at this Neighborhood Voices project summary from Portland, Maine. Review the description of the randomized methodology used to capture data. Your outreach team could develop a simple “game” method to randomly select three questions when engaging each community member. This could be as simple as numbering your questions and then rolling dice or drawing slips of numbered paper from a cup. Alternatively, have a stakeholder choose a number from 1 to 10, then select the question that corresponds to the chosen number each time an engagement moment takes place. Confirm outreach locations and work out associated logistics. Secure any necessary permissions from host organizations to set up an engagement station or table at a specific location. Assign groups of two to three team members to work together at each outreach location. Create and obtain signed permission slips and photo releases, if taking photos during the work, for any youth under age 18. Coordinate transportation of team members and supplies to and from each outreach site. Have water and snacks on hand for youth before and during their outreach shifts. Create a schedule detailing outreach dates and times, locations, assigned youth, target number of interviews, etc. Gather materials and supplies, including: smart phones, tablets (or other device if collecting data digitally); clipboards; pens; interview questions (see Section 7: Developing Key Questions); extra paper; small folding table; business cards for a point of contact at the organization, etc. Consider wearing or bringing organizational identification, such as a t-shirt with logo, pin, button, shirt, or signage. This section prompts community planning and engagement team members to think about the information they would like to gather and how to effectively interact with community stakeholders to gather it. If you’re coordinating community engagement in collaboration with a planning initiative, it may be helpful to connect with staff planners and/or project decision-makers to determine what data collection priorities or gaps might exist, if any. Next, prioritize exactly what your team would like to learn from local stakeholders and review how to develop effective interview questions. Ultimately, your team will end up with a set of questions to use in community engagement activities. This section can be time-consuming. Winnowing down to a few questions that get at exactly what you want to know can be a challenge. Consider stretching out the activities in this step across two or three different sessions. Set a foundation for understanding what good interview questions look like. Explore this tip sheet on question wording for guidance on how to develop good survey questions. Check out this simple example lesson plan for an activity to get youth thinking about and developing open-ended interview questions. Check out lesson plans and activities related to interviewing and gathering data from community members. Brainstorm quality questions, narrowing down to a final set of questions to include in your community engagement work. Ideally, you will establish 10 to 12 questions for the youth to use. The activity described below can help facilitate your team’s question selection process. You will need numerous sticky notes in two different colors. Provide each team member with a few sticky notes of each color. Team members post all questions on the wall, and the project coordinator (or a youth who self-selects) reads them out loud. The group identifies which questions should move to the “finalist” round, discarding the rest. Team members should review each “need to include” question that is not yet open-ended. If they decide to advance the question to the “finalist” round, the group works collaboratively to transform it into an open-ended question. After working through all the questions, the group determines if the “finalist” questions need to be pared down even further. If so, have the group re-examine and discard questions until an optimized list of questions remains. Finally, the group will assess whether any questions are missing from the final list. Choosing tools to collect and track feedback offers an opportunity to build your team’s digital literacy skills. Consider involving team members in deciding on a methodology to record data in the field. Organizational policy and availability of funds are likely to influence the decision-making required in this section. Provide basic training and practice to orient your team members to the tool(s) they will be using. For example, if using a digital online platform, let youth create “mock” surveys to test the different tools. Perhaps someone could volunteer to type in stakeholder questions, while someone else volunteers to review, edit, and finalize them. The day you’ve all been preparing for has finally arrived! Equipped with a list of stakeholder types, outreach schedule, and open-ended questions, your team will begin to engage with community members. Take a moment as the project coordinator to reflect on how prepared your team members are to carry out this section. Have team members role-play their engagement methodology with each other at least a few times before heading into the field. Are there any final reminders, or review of previous sections, that should occur before heading out? After concluding engagement work each day, ensure all of the data is uploaded and saved in at least one location. Backing up your data in a second location, such as a portable thumb drive or cloud, will help prevent data loss. After the final round of engagement, organize and consolidate data into one file. Excel spreadsheets like this may be helpful for organizing data. These steps may be most efficiently led by the project coordinator overseeing the team. It is now time to get organized, analyze the community data, and create a narrative to help others understand what the data means. This section engages team members in using data to support a vision, claim, or idea. You will use tools to summarize the data, illuminating the bigger picture, or cumulative voice, of the community. Discuss trends in stakeholder feedback that each team member saw or heard while gathering data. Identify both anecdotal examples (“I remember a time when someone told a story about…”) and concrete examples (“I count six people who said the phrase ‘rising rents’”). Did people say similar things? Different things? What topics, phrases, or concepts came up most often? What did team members find particularly interesting about the engagement moments? How does the data compare or contrast with team members’ own opinions and perceptions? Did you learn about any new community assets during your outreach activities? Use Groundwork USA’s Compelling Evidence lesson to review and master the concept of compelling evidence. Discuss amongst your team members: Based on our analysis, do you believe we have gathered enough information to craft a narrative message and present our findings? A word cloud generator to visually demonstrate which words appear most frequently in stakeholder responses. View this word cloud example from Portland, Maine’s Neighborhood Voices project. How many stakeholders did you hear from? What is their affiliation or demographic? Are there certain voices you wished to capture in your stakeholder sample but seem to have missed? Review the target audience you identified in Section 6.
Review the questions your team generated in Section 7. If necessary, revisit the concept and work previously featured in the lesson about Compelling Evidence. If information or voices seem to be missing, revisit and repeat Section 9 after strategizing new and different ways your team can try to reach certain stakeholder groups. If you would like support in creating ways to reach missing populations, consider submitting a request to the Groundwork USA technical assistance team. Review this example PowerPoint slide deck summarizing the Neighborhood Voices project coordinated by Groundwork USA in Portland, Maine, and the findings shared by the teen outreach team. Assign team members to complete Groundwork USA’s final Self-Evaluation Reflection lesson. Instruct team members to circle one sentence on their Reflection sheet that describes a difference they noticed in themselves after being part of this community engagement project. Assign specific, themed speaking parts for each student. Coach each team member in preparing a brief presentation “script.” Instruct team members to write their notes on index cards, including the Reflection sentence they chose to describe their experience. Check out this example speaking assignments sheet from the Neighborhood Voices project in Portland, Maine for ideas. Practice! Practice! Practice! The more your team members are familiar with the material, the more comfortable and confident they will be during their presentations. Coordinate with the organizers of the meeting (local organization, municipal agency, etc.) to co-create an agenda. Ensure your group and its presentation is named on the agenda. Ensure meeting hosts are prepared to introduce your outreach team to the audience, and invite them to participate fully in the meeting. Be sure to identify in advance one or more team members who would be comfortable with fielding questions from the audience at the conclusion of the presentation. Now is the time to shine! Present your findings to planners, decision-makers, community stakeholders, and/or advisory group members. Be proud of all you’ve accomplished! Congratulations to you and your team on completing your youth-driven community engagement project! The hardest work is done, but important activity still lies ahead. Reflection and celebration are as important as any other piece of your project, as they provide space for youth to consider what they have accomplished and learned and to communicate the value of their participation to themselves and others. By reflecting on and celebrating your team’s accomplishments, you also provide opportunities for people across your focus area to come together, appreciate the work and success of small victories, and build community. Use one or more of these reflection activity suggestions: group activity and individual/pair and share. Madeline Fraser Cook, Training & Development Associates, Inc.
Stephen Lathom, Training & Development Associates, Inc.